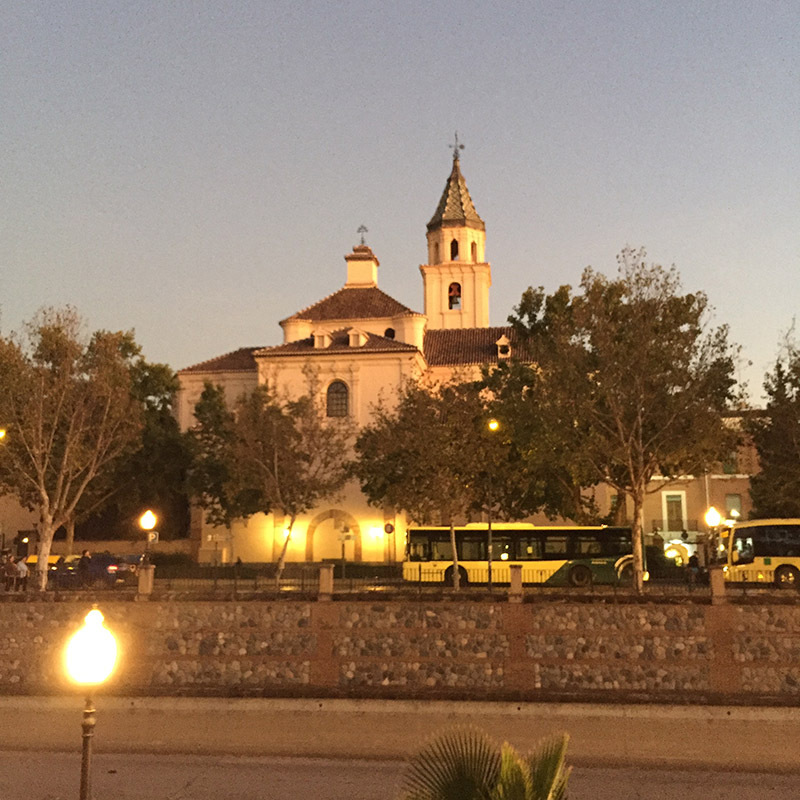 We spent the month of October in Granada City. Our year’s tenancy at Casa Magdalena came to an end on 1st October, and we knew that the owner intended to visit the house once we had vacated. That all sounds very final, when actually it wasn’t, as we did agree to continue to rent Casa Magdalena once the owner had paid a visit. Initially, we did consider moving to Granada for the winter, and renting a flat for 6 months, just to see what Spanish city living would be like. As it happens, we then decided that we loved Casa Magdalena so much that we would welcome another winter snuggled in front the fire, clad in our thermals, venturing out for amazing walks in the crisp, clear light of the winter days. So, we resumed out tenancy on 1st November, and we decided to stay in Granada for just the one month. Of course, that rather limited the range of accommodation we might have at our disposal. Letting agents like a minimum of 6 months, so that was out. We tried the AirB&B route, but as October is a fairly busy time in Granada, very few hosts were willing to offer a reduction for a stay of 30 nights, and we were not going to pay 2,500+ euros for the pleasure of our stay. As a result, we panicked somewhat, took a look at a holiday flat in the very heart of the city and agreed to take it for the month. The flat is just below the Alhambra, and a mere spit from Plaza Nueva. On first inspection, it was clean enough, and had the wi-fi that we both needed to do our various work-related things. The bedroom was a cave, but that would be exciting, no? We both hate moving house. It is such a tiring and thankless chore. Fortunately, we were able to leave a lot of our stuff in Casa Magdalena, so on the face of it, we didn’t have too much to move. However, we couldn’t park the car outside the flat, and had to lug our belongings over cobbled squares, up stairs, along a narrow lane, up more stairs…..hated it. Oh and let's not forget that Andrew had one hand in a plaster cast at the time. We moved on the Sunday and I was due to start my new teaching jobs on the Monday, so had no time to blink. On the Monday, I quickly realised that I had made a mistake accepting two teaching jobs. One of them involves teaching every morning, Monday - Thursday, and the other involves teaching every weekday afternoon and evening, sometimes until 9.30pm. That first week, a generous student decided to pass on her cold, so that started to germinate just as I was realising that 12 hour days probably were not what I had signed up for. Andrew, meanwhile, was left in the flat while I trolled around Granada carting a bag full of grammar books. He discovered that the wi-fi was not quite as ‘fi’ as we had hoped. It transpired that the router that served the various flats in the building was located in Flat 4, and the guest in Flat 4 kept unplugging it so he could charge his mobile……interesting. We managed to persuade the manager of the flats to invest in a wi-fi extender, which helped a little, as long as the main router remained plugged in. On one day, it rained for most of the day, and frequently heavily. In the country, we welcome the brief bursts of rain; in the city it has less charm. In a cave, it has no charm whatsoever. The cave became damp and fetid. Paint constantly flaked down on us from the rocky ceiling, and getting ready in the bathroom was rather like standing in a blizzard. As a result, my cold got worse until I ended up with something akin to consumption. My lungs are only just clearing up now that I am back in the clear air of the valley. Andrew enrolled in our old school once again, to brush up his subjunctive, and he did manage to get out and about in the city. Sadly, this made my demeanour worse as I saw very little of this beautiful place during the week, and at weekends I was either too tired or was preparing for the next week. Never let it be said that teaching is easy. It is bloody hard work. You stand for hours in front of a class, are constantly on display, have to concentrate and engage with your students, and then when you are not actually in the classroom, you are trying to create stimulating and educative content for the next day. All this for 10€ per classroom hour as a salary…..Harsh reality check. I was not much fun to live with! OK, that accounts for the ‘worst of times’ bit. Granada is the most gorgeous city. I compare it to Cambridge and that city’s own European twin, Heidelberg. Pretty, small enough to walk around, steeped in history and with a warmth and heart that is hard to find elsewhere. We both love this place hugely. We did find the time to explore some of the city’s hidden treasures - gardens, houses, and many new bars and restaurants as you will have read in earlier posts. It is a bustling, colourful place and the best times are undoubtedly the mornings, when the sun is casting its first light on the gracious buildings surrounding Plaza Nueva, just before the daily activities begin in earnest. It is a welcoming and warm place, and we feel that we have genuinely made very good friends here, both Spanish and International. Being in the city centre made it easy for us to meet up with friends for tapas after work, or catch up for a coffee. Indeed, we spent most of our time eating and drinking our way around Granada. Our 'penthouse' cave had a 2-ring hob and no oven, so preparing a decent evening meal was too hard to even contemplate, so we took the easy route, whizzing through cash like a dose of salts. But hey, our philosophy is that when times get a little rough, throw money at the situation. It was an adventure. Cave living is definitely not for us. The flat remained constantly damp. The one window we did have, large as it was, merely served to allow tourists who incessantly trouped past to gaze up and into our goldfish bowl. I think you might be able to gather that we did not enjoy our stay in the flat. Granada was, and is a different matter. I still troll the streets with my bag of books, I am still working too many 12 hour days, but I am happier knowing that I am not returning to Cueva Consumption. It is far from ideal, as Andrew is now rather stranded in Casa Magdalena for as long as I am cramming my students’ heads with Prepositions and Present Perfect nonsense. Steps, however, are being taken to rectify matters. October was a period of learning, of standing on our own feet and getting some clarity surrounding our future here. We needed to have a bit of a tough time to remember why we are here and what we so love about this amazing country. Despite the horrors of the cave, we did eat some delicious tapas and worked our way through some fabulous bottles of wine, so every cloud has a silver lining….